You may be surprised to learn this but the newborn photography industry is unregulated. 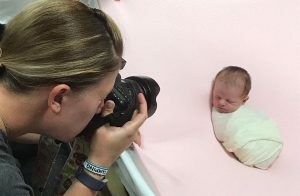 And that means, unfortunately, that it isn’t essential for people to have professional training about baby safety before becoming a newborn photographer. So, there are photographers out there who are offering their services without understanding how to safely handle and pose newborn babies. Quite frankly, the thought of it makes me shudder! In my role as a National Ambassador for BANPAS – the UK’s Baby and Newborn Photography Association that promotes safe practice in the industry – I’ve certainly heard far too many horror stories of babies being put in harm’s way by untrained or inexperienced photographers. As every parent knows, newborn babies need to be handled with the upmost care. But, when hiring a photographer, some parents fail to check beforehand that their chosen photographer will conduct the photoshoot safely. The question of price is usually a major consideration. However I think that the first question parents should ask is, “what is your level of experience?’ & ‘Are you safety trained?’. Now, to be fair, if you’re someone who hasn’t hired a newborn photographer before, of course, it’s not your fault if baby safety hadn’t occurred to you as one of the things you should consider. But I hope, after reading this, that you’ll understand why baby safety in newborn photography is so important. And that when hiring a photographer, you should only select someone who can reassure you of their professional standards and can demonstrate how they safely produce baby portraits. Safety trained can include having attended a paediatric first aid day. It can include having attended in person or online seminars on newborn posing & safe working practices. It may include a wealth of parental experience (with the caveat that some of the best newborn photographers & ones I consider personal friends – are not parents themselves). Photographers reading this article can find free safety downloads presented by myself for BANPAS here. There’s no need to be a member to gain access but I highly recommend joining! When you welcome your baby into the world, you’ll instinctively handle them as carefully as a china doll. To you, they’ll seem so small and so precious. You’ll want to wrap them up in cotton wool (ok, not literally, but you know what I mean!). So, it makes sense that when you allow other people to hold your baby, you’ll expect them to hold him/her in the same way. I’m proud to say that when you hire me as your newborn photographer, your baby’s safety certainly becomes my number one priority. Baby safety in posed newborn photography is something I know a lot about and is a subject that is very close to my heart. And, I’ve got over seven years of experience under my belt (Yet, despite this, I still have regular safety training and make it my mission to ensure that my skills are bang up to date). I’m also a proud member, and even a twice-nominated Ambassador, of BANPAS for the Wales region. As just one of 11 UK-based Ambassadors of BANPAS, I officially help to promote safe practice in the industry. In online communities and in person, I support other newborn photographers and help to champion the important message about baby safety in newborn photography. I see it as doing my bit to help raise standards in the industry and to ensuring that no babies come to any harm during newborn photoshoots. Well, I hope that my experience, qualifications and Ambassadorship of BANPAS reassures you. When hiring me, you’ll be assured of an experience in which your baby will be cared for as carefully as if he or she were my own. I promise you that I only create photos in a way that is 100% safe for your baby. Tip for parents – wear light layers when coming for your photoshoot – it’s cosy in my studio! And they certainly won’t be placed in baskets, boxes or on any surface whatsoever without being held or supported. Bless them, they’ve no chance of supporting their own body weight as newborns, and they should never be expected to! Remember, when you hire a newborn baby photographer, you’re putting your complete trust in that person to hold and look after your baby. You’ll pass your newborn over at the start and then leave them to do all the settling and posing – it’s a hands-off experience for parents. So, you’ll want to feel comfortable with the newborn photographer you’ve chosen. 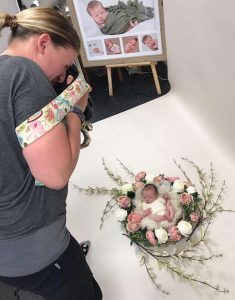 Let’s face it, you probably won’t have passed your baby onto many people outside of your immediate family before coming to your newborn photoshoot. It’s a big step to hand them over to a stranger. Do please ensure that you are selecting a photographer who’s number one priority is your baby’s safety. If you’d like any more information about BANPAS or about safety in newborn photograpy, visit the BANPAS for Parents website. Or, if you have any questions or concerns about newborn photography and how the images are created, please contact me on 07788 870400 or email me on cass.davies@me.com. *with thanks to my lovely clients for allowing me to use their behind the scenes photographs. Sam Kirk & Katie Allen.